So this lunchtime before taking a long walk out across the hills of the Ridgeway I bored Julie to tears by dragging her to the small but perfectly formed Oxford Museum of Modern Art to catch the last day of the Callum Innes exhibition entitled From Memory. Innes is a Scottish painter I have admired from a distance in the past, always enjoying his paintings when I come across them, but never really investigating his work any further. From Memory contains about two dozen paintings, most of which are quite large in size, and all from the last ten years. Innes’ work is hard to categorise. There are obvious links back to the abstract expressionists of the 50’s in his painting, but he takes a very individual and focussed approach to his work. Standing back and taking in the work from a distance you could be forgiven for taking Innes to be the archetypal modernist, large expanses of geometric colour and shades of grey placed onto canvasses that differ only very slightly from the one hanging next to them, but step closer and the real depth to Innes’ work begins to reveal itself. Innes seems to use the process of removing paint from the canvas just as much as applying it in the first place. Many of the large blocks of colour appear to be treated with some form of paint thinner to remove the surface, before he repaints, removes, repaints, to leave a deply textured surface full of almost incidental detail. Other areas show signs that the paint has been scraped away to leave hollow shells where the colour used to be. The paintings exude a physicality to them, almost as if they are works in progress, waiting to be taken down to have the next stage of work applied to them. Some of the smaller paintings in the show involve single blocks of colour into which it can be seen that Innes has carved away the thick paint down to the canvas, rendering the works almost as reliefs as much as paintings. I felt a similar feeling stood in a large hall of Innes’ Exposed Painting series of canvasses as I do in the Rothko room at the Tate Modern in London. 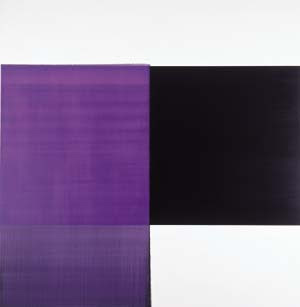 The large looming works have the cumulative effect of creating a sombre atmosphere in the room, the deep greys and dark purples that spread across one wall in particular portraying a feeling of quiet introspection, making their mark but doing it in a reserved, almost stately manner. Away from the big halls I was very taken with a small side room that only housed two paintings, one of which, entitled Resonance One at first appears to be entitrely black, but on closer inspection can be seen to be made up of many layers of paint, partly removed in thin, irregular vertical lines allowing the layers below to shine through. The painting is placed in the darkest corner of the room, where this detail is virtually impossible to perceive, but with a window set in the slanted celing projecting a square of light directly onto the work, revealing under this natural and slowly moving spotlight the hidden depths of the painting. This work in particular held a simple yet romantic appeal for me, a work that would appear different to its viewer depending on the time of the day you came to see it. 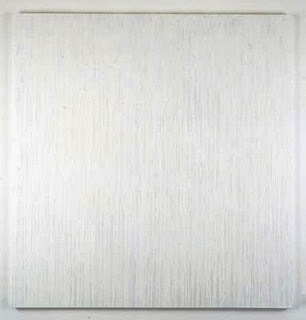 For some strange (but probably quiet obvious) reason I tend to compare abstract painting to music, and inevitably I find traces of Feldman in Innes’ work with the repetition of colour and line betrayed by close inspection that shows individual beauty in every small detail. My recent review of Radu Malfatti’s recent minimalistic music spoke of how his compositions resemble complex works that have had large portions removed, erased by the composer, leaving just trace elements behind for the listener to decode. 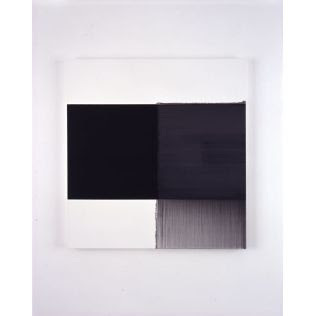 Those thoughts were also in my mind wandering around the Callum Innes show today. My enjoyment of the From Memory exhibition was spoilt by my learning that just two weeks ago a concert of music by Tim Parkinson and James Saunders, two up and coming London composers and Wandelweiser associates whose music I am enjoying a lot had taken place in the adjoining cafÃ©, all just six miles from my home. Its a small world, but it seems not small enough for me to have found out about this in time. Oh well, maybe next time. Glad you caught this exhibition, Richard. I hadn’t heard of Innes before but I went to the show about four times – I was really bowled over by it. Shame you missed the Parkinson/Saunders concert – they played some great pieces but the audience was sadly a little light. About the Nono pieces – ‘Como una ola . . .’ is from ’71 to ’71, while ‘Y entonces comprendio’ is from ’69 – ’70. Probably before your favourite period but interesting nonetheless. If I ever get myself a USB turntable I get copies to you. Oh, and being really pedantic – shouldn’t there be one more ‘Nono’ in the title to that post?! HI Dom, yeah really peeved I missed that show. I was sat at home six miles away whn it took place and could easily have been there. Oh well. I actually found out that the Oxford MoMA was open yesterday (Sunday) for a while so I went again to the Innes show for what was definitely the last day, this time sans girlfriend so I coud really relax and take my time with the paintings. I saw some Innes paintings down in St Ives at the Tate last year as he had some kind of residency there previously, but otherwise his work was new to me too. I certainly hadn’t seen his work in anything like this kind of depth before. Oh yes Dom, I checked it out and yes you are right there should be one more Nono in the title… I’ll go and amend it now!